I’ve always wanted a full skincare range that has hyaluronic acid as the main ingredient, and guess what?! I FINALLY FOUND IT and its from a brand called White Formula, a Taiwanese beauty skincare product. I was entirely hooked when I found out that their products use 3 types of patented hyaluronic acid. And if you don’t know, Hyaluronic Acid is a well-known ingredient for skin moisturizing. So on days when youre lacking of moisture, the white formula would be what you'll be looking for. Within the White Formula Super Moist Range, contains 3 types of patent Hyaluronic Acid to Transmit Moisture, Replenish moisture and retain Moisture. And in this blog post I will be sharing with you a detailed write up on the White Formula Super Moist Facial Foam, Toner, Lotion, Gel and Essence. First up for review would be the Super Moist Facial Foam with Hyaluronic Acid. Other than containing 3 unique types of Patented Hyaluronic Acid, it claims to boost your skin hydration up to 10 times! From my first wash with this foam cleanser, it was like instant love. It cleanses while providing deep hydration, firming and long lasting moisturization. It comes in a tube of 120g and its suitable for people with normal to dry skin. This cleanser is to be used twice daily, once in the morning and once at night. Like any other cleanser, apply about 1cm of the cleanser to palm and lather before applying to wet face. Give it a good massage in circular motion and rinse thoroughly. After using this for about 2 weeks now, i realized that my dry patches are gone, so i approve that it moisturizes the skin really well. After cleaning, it would be highly advisable to use their Toner with Hyaluronic Acid next. The toner comes in two forms, one in Rich (suitable for normal to dry skin) and the other in Light (suitable for normal to oily/combination skin) . But as for me, im using the refreshing light formula since i have oily combination skin, and did you know that it happens to be the Leading Super Moist Toner in Taiwan? Upon applying it to my skin, I find that its easily absorbed by my skin, and its non-sticky, making it suitable for even acne-prone skin. It claims deeply hydrates the skin , forming a protective layer to prevent moisture loss. Other than that, it stimulates collagen regeneration, leaving the skin feeling firm and smooth. To use, simply apply evenly all over the face and neck after cleaning, once early in the morning, and once after showering at night. In my case, I decided to use a cotton pad cause i think its more hygienic than using bare hands. After application, I usually like to give it a light pat to encourage better absorption. To use, I usually would apply this evenly all over my face and neck after toner, twice a day with a cotton pad. Then I’ll give it a massage in an upwards motion to encourage firming. Im still amazed that the bottle of lotion is huge and it would definitely last me for more than 2 months. This might be my favorite lotion cause it does not leave any sticky residue after application. After lotion, i applied the Super Moist Gel With Hyaluronic Acid. Other than containing 3 unique types of patented Hyaluronic Acid, it also has 2 unique patented moisturizing ingredients which are also known as Ceramide and Moist 24. It also contains naturally extracted ingredients that boosts skin defense and provides long-lasting moisturization to last you the entire day. The modern gel nowadays are pretty advance, and usually comes in a 2 in 1 feature. So guess what?! You can either use this gel in your skincare routine, or use it as a face mask and leave it on overnight. To use, apply it evenly all over your face and neck after lotion and massage gently in an upward motion. I decided to use a spatula instead of my fingers to keep it clean. Personally, i was impressed with the texture of this gel. It felt very light on my skin, and it was well absorbed too! The gel instantly felt like water once it was in contact with my skin, so it did left my skin feeling cool after application. And last but not least would be the Super Moist Essence with Hyaluronic Acid. This essence is definitely different that the usual essence that i use cause its not at all milky. This is a little special than the first 4 products cause it contains an extra type of Hyaluronic Acid which would be the Hyaveil. It claims to provide up to 10 times hydration power while stimulating collagen regeneration. Love how it feels on my skin as my skin absorbs the product really well and it doesn't leave any sticky residue. To use, apply it evenly all over your face and neck after gel and massage gently in an upward motion to encourage firming results. Its super light, and the texture was almost similar to the gel, just that instead of a jar, it came in a form of a bottle. I would say that this essence gives you a boost in moisturizing if you skin is dry, but since i have oily combination skin, i only use this once every 2 days. As a verdict, i have to say that this would be my current choice to purchase when im on a tight budget, but looking for a good skincare product. The price is really affordable and the packaging for each product is huge! I would say that if you buy the complete range, its good enough to last you for up to 3 to 4 months. This range is suitable for normal to dry skin, making it versatile for almost any skin type. Their range gurantees that there are no alcohol, no fragrance, and no collorant was used to produce these products. And i did noticed that the formula is really gentle on skin, which makes me love it even more. So thats all for now. To purchase, make your way to MYCARE's facebook at https://www.facebook.com/mycare.malaysia to order today! 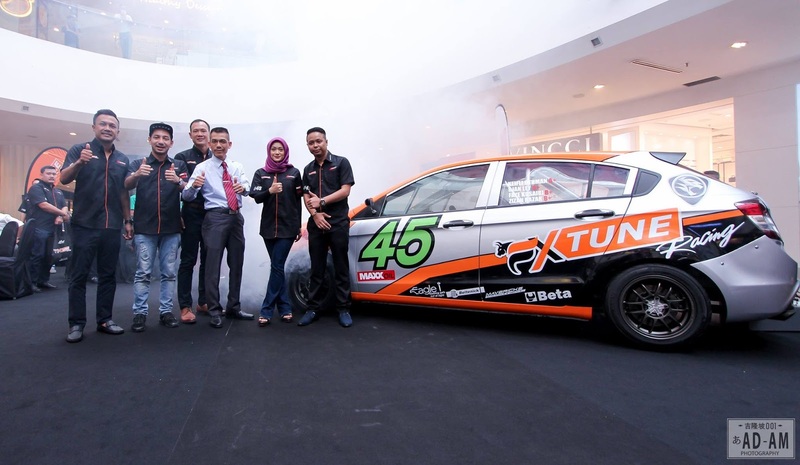 After winning the Malaysian Speed Festival recently earlier this year, the Mayhem team will be competing in the Sepang 1000KM Endurance Race on the 1st of September to the 4th of September 2016 organized by the Sepang International Circuit Sdn Bhd. And this time around, Mayhem FX-Tune will be introducing a professional driver, Tengku Djan Ley, who is also well known as the Prince of Drifter alongside with Zizan Razak and Faye Kusairi. We had Mr Megat Shazreal who was the team manager who shared a few words about the team. He highlighted that Tengku Djan Ley will be in the list of racers representing Mayhem-FX Tune Racing Team in the Sepang 1000KM Endurance Race which will be held between the 1st of September to the 4th of September 2016 as they will be having high hopes on winning this years race. Managed to had a little chat with Tengku Djan, who is also known as the Prince of Drift. He shared with me that he's super thankful to his family and supporters for getting him to where he is today. Advices that he shared to me to young drifters was to always be safe when driving, and NEVER ever practice drifting on a public road. It was a lovely chat with Tengku, and personally, i like his humble personality. The Sepang 1000KM Endurance Race was a success over the previous years, and this year they will witness cars below 1600cc competing with participants from Australia and Japan. The Sepang 1000KM Endurance Race will have 2 to 4 rounds in one day to finish a distance of 1000KM at one go which will be challenging the physical and mental strength of the participants of the race. 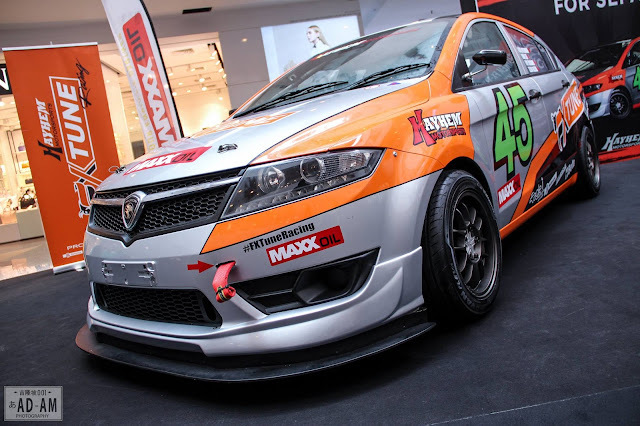 The Mayhem Team will be using a Proton Suprima S which has been exclusively provided by R3 to be featured in one of the worlds motorsport race and also one of the BIGGEST race in South East Asia. Mayhem has high hopes on winning this years race, all thanks to FX Tune, Proton, Mayhem's Technical team, Beta Tools, Mavericks Garage 21 and Beltenick for sponsoring the team. For more details on the coming event, head on over to http://www.sepangcircuit.com/events/sepang-1000km-endurance-race/event-info for more details. Fashionista's, Diva is now back with How Do I Look Asia Season 2. Im assuming that the first season went really well, they decided to continue with Season 2. I believe that we are all secretly fashionable, but a little guidance from Diva helps no? I got invited to attend DIVA's Roadshow as a Clozette ambassador and i have to say that the roadshow was a hit! With tons of people at the event , i can confidently say that many are excited for the premiere of How Do I Look Asia Season 2. I know i am! Just a little FYI on the roadshow in case you missed out, anyone present at the roadshow was entitled for a beauty makeover! There was a counter at the event for registration, and all you need to do is to fill in your details and get your hair, make-up and nail done at the event. And whats more exciting? You'll also get an exclusive gift from DIVA upon completing the beauty fix list. Complimentary make-over + a gift? No wonder there were so many people at the event. Being Malaysian, we know we all love free stuff. lol. So, upon registering, we were then brought to a photo bar where we were instructed to take a before picture so that you can see the results for yourself once you got your makeover done. There were 3 stations to visit, which would be the Hair Station, Make up Station and the Nail station. I personally got my makeup done already, so i decided to get my hair done since it looked like a mess. Visitors of the roadshow could actually opt to not do all the stations, but they were also free to do all three if they wanted to. From the photos above, you can see that i decided to get my hair done while my mum gets her make-up done by a professional make up artist. Hehe. What better way than to bond with your mama by getting all glammed up together right? While we were there, passerby's were also entertainment. Each hour they had different activities going on, from random competitions to performances. It was definitely a once in lifetime chance to get yourself up on stage and possibly win a RM1000 shopping spree! I was daring enough to also put myself up on stage, and brought home a goodie bag with a hair straightener in it. I even got the chance to watch De Fam, who performed live in front of Sunway Pyramid's shoppers. Whats in my goodie bag? And tadaa, I got my hair done and wouldnt you say that i look Fab?! Since i brought my mama along too, both of us had a major make-over and i think we're both pretty satisfied with our new look. Hehe. Im sorry if you missed out on the roadshow, but fret not cause we have Jenny Mai as the main host for How Do I Look Asia Season 2 as your fashion advisor telling you all the secret tricks on looking effortlessly fabulous. Be sure to catch the premiere happening on the 29th of August 2016 (Monday) at 8pm! Be sure that you have DIVA on your tv, cause you wouldnt want to miss out on this. Hey hey, let's get a little personal on hygiene. As we grow older, every woman needs to know and understand the needs of their own body. Hygiene is really important, especially when it comes to keeping your 'V' clean, wouldn't you agree? And that is why, in today's blog post, I'll be talking about the Sumber Ayu Hygiene Wash which is available in Malaysia nationwide. If you are unaware, the V area is where thousands of good bacterias breed, keeping the V away from any infections or discomfort. Bacteria within the V area is its own ecosystem to provide the balance of the pH levels which also protects the area from being infected by diseases and germs. According to general knowledge, cleaning your V area with soap and water will interrupt the balance of bacteria in the area causing it to be exposed to higher risk of getting infected. This is why, when it comes to intimate hygiene, it's extremely important to know how to care for your V, and one of the ways to complete your bathing routine is to have the Sumber Ayu intimate hygiene wash in hand. It's formulated with natural ingredients to ensure that your V is constantly clean and healthy, protecting it from bad bacterias, rashes, and stinky odor. The pH level of the wash is at a level of pH3.5 which is the ideal to sustain the ecosystem of your V. Who knew it was such a big deal to be sure about the pH levels before washing your special parts. The main extract would be lemon grass as the new ingredient within the Sumber Ayu formula which provides protection without bacteria. This formula has been improved with naturally scented ingredients to give you freshness to last you all day long. Other than that, it also has a whole new look which is fresher and trendier. So if you see it in stores, be sure to grab one today. The bottle design which was inspired by a figure of a woman has been maintained, but what makes it different would be that they have a newer look with interesting choices of colors to provide a more sophisticated look. The Sumber Ayu intimate hygiene wash has been officially announced as a Halal product by the JAKIM, making it perfect intimate wash for Muslim users and non-Muslim users. The Sumber Ayu intimate hygiene wash is an ideal product for every woman from different ages, and now its available in 6 different fragrances, giving you more choices to choose from. But I decided to review 3 out of the 6, which would be the Sumber Ayu Floral, Sumber Ayu Orchid and Sumber Ayu Musk. The Sumber Ayu Floral has a combination of a variety of flowers which provides all day freshness. This would be a perfect fragrance for those who are always happy and carefree. The Sumber Ayu Orkid provides a very light fresh scent, keeping you feeling clean all day. I would say that this would be suitable for those who are elegant in her own ways. And last but not least would be the Sumber Ayu Musk, which has a natural freshness scent to keep your v feeling fresh. This would be suitable for those who admire musky scents, giving you a more mature scent. When in contact with water, it doesn't foam up like normal soap and I have to say that it feels really gentle on the skin too, making sure that it does not irritate the skin. I also admire that after showering, it also keeps your V feeling clean and fresh as ever without harming the good bacteria's to keep it protected from harmful germs. As for the price, I would say that it's reasonable and affordable making it assessable to anyone who needs to learn how to keep their V clean and fresh. The SUMBER AYU range is now available at RM3.60 for a 90ml bottle and RM5.80 for a 200ml bottle. This range is brought to you by Wipro Unza and is now available at all supermarkets and pharmacies. Be sure to visit your nearest store today, and get a sniff of this improved new formula by Sumber Ayu. I personally love the Sumber Ayu Orchid cause the scent really relates to my personality. So what are you waiting for? Find out what's your favorite Sumber Ayu hygiene wash today! Im back after a month! Hey guys, and i am back! Just to recap everything, I was introduced to Realash about a month ago, and if this is your first time hearing about Realash, let me share a thing or two about the Brand. Realash Cosmetics was born in France and are available in 35 countries nationwide! Their products are inspired by nature, where they discover the wonderful properties of natural plant extracts to produce innovative eyelash enhancers that deliver high effectiveness and safety proven by clinical studies. But in today's blog post, I'll be talking about the results of the REALASH Eyelash Enhancer and the Brow Conditioner. I've been using these products for exactly 4 weeks, and well, the results really surprised me. I'll give a more extensive review on the products below and how I used it too! So if you're looking forward to finding out on the results, scroll away! First up would be the REALASH Eyelash Enhancer. As mentioned in my previous post, this innovative enhancer's mission is to increase density and lengthen your eyelashes. It also claims to enhance your lashes up to 83% longer and 79% fuller results, with no side effects reported during the clinical test. So based on my personal experiences, I applied it like a liquid liner, every night before I go to bed. The first week did made my eyelashes feel a little sensitive, so I admit that I had given my lashes a break from the serum when that happens (Guilty as charged). But I have no guarantee that its caused either by the serum or by my makeup since I was wearing falsies for a glam night dinner events I had to go for. So my results are purely based on like a 4-5 days usage for a week. From the before and after shot, I think you can tell that my lashes did grow longer and thicker despite not following the 7-days a week routine. So I can proudly say that it does work! 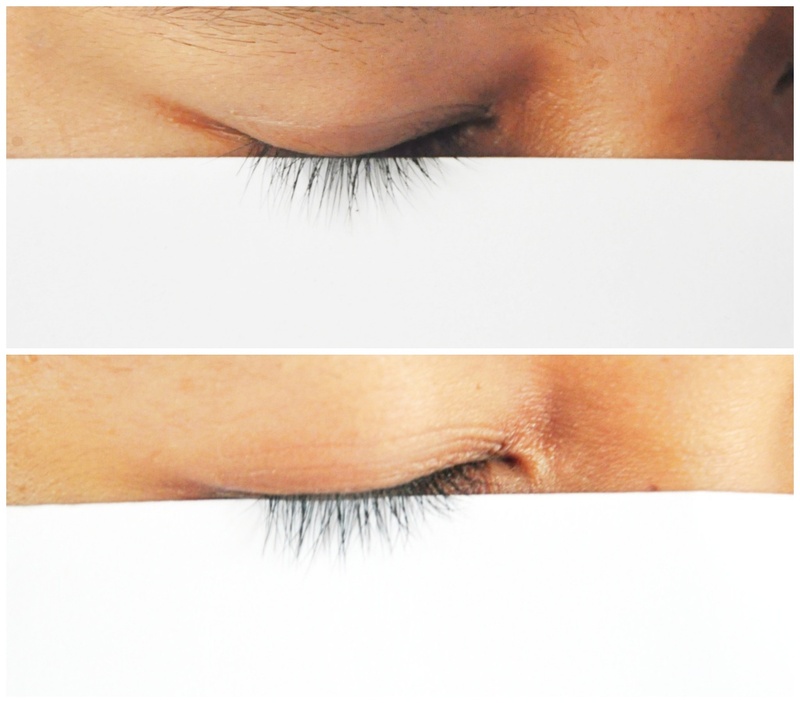 Its very natural, and after a month of using it, my lashes feel fine and normal. Just more enhanced than before I guess. Hehe. Next would be the REALASH Brow Conditioner, which is suppose to enhance the look of natural, boldly defined brows by making them fuller, darker and simply gorgeous. And as mentioned in my previous post, it claims to guarantee full brow regeneration and care for the delicate skin around the eyes. Applying this every night wasn't a problem at all and I have to admit that my brows arent that thick, to begin with. So when I applied it, I gave it a swipe with the applicator, leaving my eyebrows feeling cool before dozing off to bed. haha. It really just feels like you're swiping water onto your brows, so I actually enjoyed applying it every night. It wasn't as hard to apply compared to the Eyelash Enhancer since it doesn't require as my precision. And tadaa, the before and after shot! 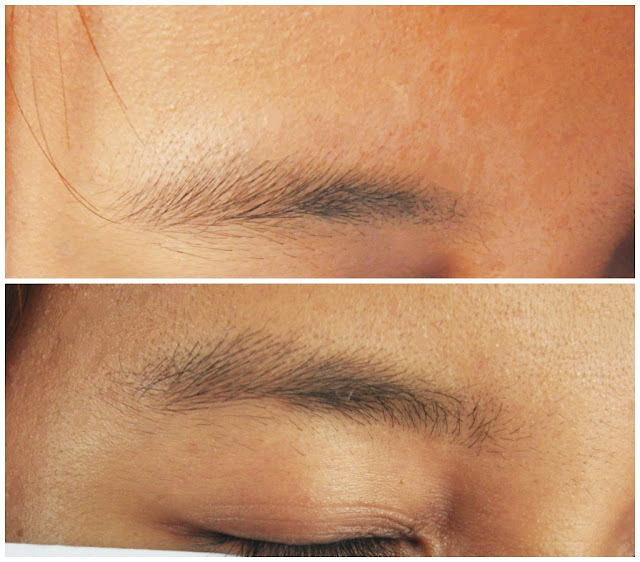 If you ask me, I reckon that my brows do look fuller compared to the before photo. I admit that my brows do look nicer cause I shaped it about 3 weeks ago, and even after freshly shaping my brows, applying the Brow Conditioner did not leave any side effects which I'm happy about it. So I guess it does do, what its suppose to do and I approve on the results. As a verdict, I have to say that I love how its easy to use, but I guess it may take a while to see results (which means you have to be patient). I think its pretty obvious that everyone hates waiting, so if you decide to give REALASH a chance, be sure to mentally be committed to using the product daily in order to get the best results. If you have a special occasion to get dolled up for, start planning your REALASH routine a month ahead (The earlier the better). And there you go. I hope you enjoyed reading my blog post and if it answered your questions. I apologize for not taking weekly photos cause y'know, im pretty caught up with time. SOBS. But I hope my before and after photo is clear enough to satisfy your curiosity. Thanks for reading my review, and if you're seeking more information or products that REALASH has to offer, head on over to http://www.realash.com.